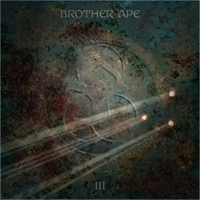 Review: "Brother Ape: III" - Sea of Tranquility - The Web Destination for Progressive Music! Brother Ape has made a career out of borrowing from other bands: Styx, Saga, Toto, Galahad and even Weather Report. Now comes the Swedish band's simply titled third album, III, which � pardon the expression � apes the Flower Kings ("Monday Breakfast"), Marillion ("All I Really Want") and even Fleetwood Mac ("Immortal"). This trio (formerly a quartet) has always been tough to wrap your ears around, filling 2005's On the Other Side and 2006's Shangri-La with modern and retro prog references, flurries of fusion and a savvy pop sensibility that should make Brother Ape's music at least a little more accessible to your non-progging friends and family members. And, really, III is no exception. Lead singer and guitarist Stefan Damicolas' flexible vocals add variety, while the band's jazz tendencies manifest themselves in some form on nearly every one of these nine tracks. Keyboardist Gunnar Max�n shines on "All I Really Want," the trio shows off sweet Yes-like harmonies on "Another Day of Wonder," and Brother Ape powers up the guitars on "No Answer" and "Human Equation" to put the "rock" in this distinct brand of "prog rock." All that said, however, elusive hooks and a lack of musical identity still keep Brother Ape in the "acquired taste" category. And at this point � more than a dozen years after the band first formed � it probably will always remain there.